Even those who know and love crisp, clean endive would never claim it a celebrated vegetable. Grown in the dark, in conditions similar to your ideal mushroom-growing climate (e.g., dark, cool, and humid), endive has a subtle bitterness when raw, but when sautéed or braised, that bitter edge shifts and the tender endive mellows, becomes nuttier, sweeter, and virtually transforms into a brand-new vegetable. Whether you prefer to scoop dips into the crunchy canoe-shaped leaves or chop the heads (also called chicons) for a refreshing salad add-in, endive is vegetable that’s too often neglected but arguably just as versatile as any other beloved leafy green—from kale to swiss chard. As a member of the chicory family which also includes radicchio, puntarelle, curly endive (or frisée), and escarole (also called broad-leaf endive), the endive we’re focusing on today goes by many names. 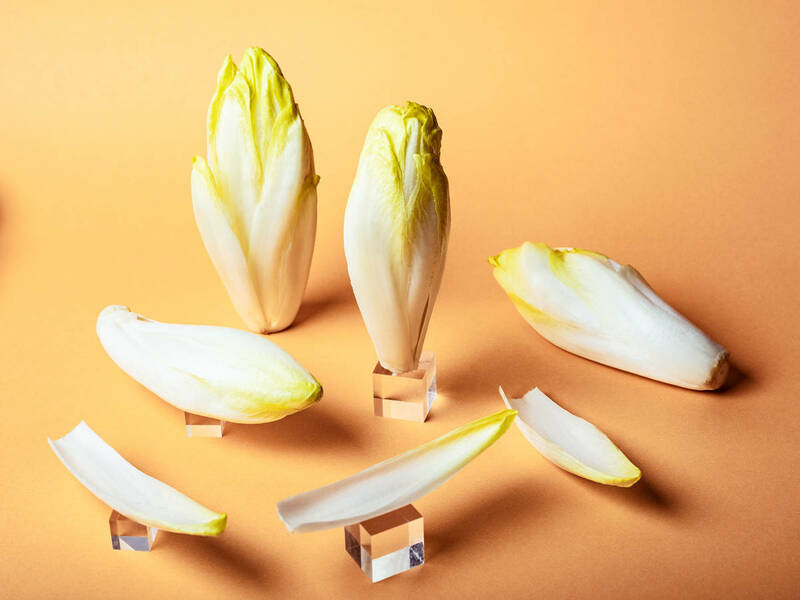 Depending on where you’re from, you might know the pale, elongated heads as Belgian endive, Dutch witlof, witlof, or more simply, chicory. No matter what you call them, endive are extremely recognizable in look, flavor, and texture. With a snappy, crisp bite and a refreshingly mild bitterness, raw endive usually finds its way into salads, but the separated leaves can also be used as an edible tool for transporting dips or various fillings from plate to mouth—making them an ideal partner for crudité platters. For a mellower flavor and softer texture, endive also can be grilled or sautéed, braised or baked. A unique part of the endive’s story is how it’s grown. It’s a difficult vegetable to cultivate, requiring it to be grown from a seed, dug up, and then prepped to be re-rooted in a dark, cool, humid room for a final growth period before harvest. Due to these particular growing conditions, endive can usually be found all year around, but the traditional peak season is from late fall through early spring—usually September through April or May. Endive is relatively hearty vegetable with sturdy leaves that cling tightly to one another. The long arrow-shaped heads should be heavy for their size and firm, with snug, overlapping leaves, and a bright white base with just a splash of yellow (or purplish red) on the tips of the leaves. Look for smooth heads with no brown spots and a moist-looking, pale colored base where the head was cut from the root. There’s really only one best way to store endive, and that’s by keeping them in your refrigerator’s vegetable drawer. As long as they stay cool and out of the light, these little babies can last for quite a long time. If the outer leaves start to brown and become soft when pressed, simply peel them off and discard. The inner leaves should be just fine! Endive, unlike some of its leafier cousins (we’re looking at you frisée), is extremely easy to clean. Simply remove two or three outermost leaves and chop off the very bottom of the base. No rinsing, washing, or salad spinners necessary. To separate the leaves for some high-octane scooping, simply trim off more from the root end of the endive head and pluck the leaves off. To chop for salads or other raw preparations, slice the leaf tips off and set them aside, then thinly slice the rest of the endive at an angle or straight across. To prep endive for baking, grilling, roasting, or sautéing, chop the root end off and halve or quarter the heads lengthwise. What’s your favorite way to use endive? Let us know in the comments below or share your favorite recipe with us at community@kitchenstories.com.